The tail of the AirAsia aircraft with the black box and flight recorders has been located underwater in the Java Sea, said the QZ8501 flight search and rescue chief in Indonesia on Wednesday, according to Reuters. The finding could give the investigation a clue to solve the mystery of what caused the crash on December 28. During a break in the bad weather hindering the search efforts, at least two divers plunged into the rough seas early on Wednesday in the area, where the US Navy had detected two objects, supposedly chunks of the fuselage, at a depth of 28 meters near the Karimata Strait, AP reported. “We’ll start to identify the wreckage, which appears to be part of the jet's body, as quickly as possible,” Indonesian search and rescue operation coordinator Tatang Zainudin told reporters. 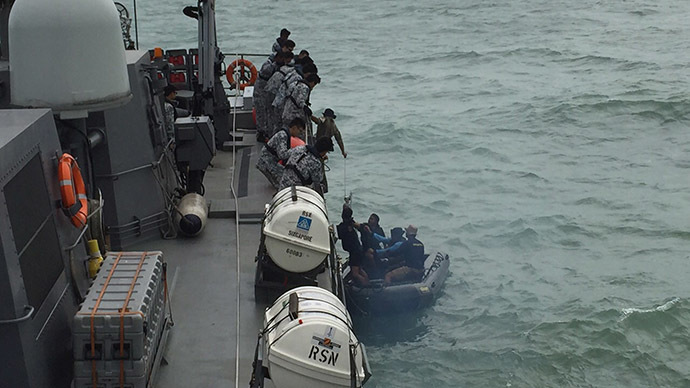 An international team of planes, ships and personnel are continuing their efforts to search for AirAsia QZ8501. No survivors of flight QZ8501 have been found. Out of 41 bodies recovered, only 16 have been identified, as of Wednesday. It’s the 11th day of the search for the wreckage and victims of an AirAsia flight with 162 people on board that lost contact with air traffic control during a flight between Indonesia and Singapore. Anton Castilani, head of the country's disaster identification victim unit, said that after two weeks most corpses will sink, and be difficult to trace. The flight was carrying 137 adult passengers, 17 children and one baby, along with two pilots and five crew, most of them Indonesians. On Wednesday, AirAsia confirmed it would offer compensation to family members of victims, the Wall Street Journal reported. The company said it’s talking with families individually to show its “good intention,” first addressing the families of those who have already been identified. Some families had already been offered initial compensation of about $24,000 for each victim, several family members told the Wall Street Journal on Monday.